Birth, death, and marriage records before 1951 are kept at the County Clerk's Office in Belton. After 1951, the cities of Temple and Belton record their own death records. Records of births and deaths that occur within the city limits of Temple are kept in their respective Municipal Buildings. The County Clerk's Office continues to house birth and death records for the rest of the County. Divorce records are kept by the County District Clerk. 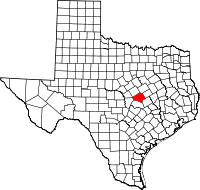 Five years after Texas entered the Union, Bell County was created from Milam County and named after its creator, Governor Peter Hansborough Bell.